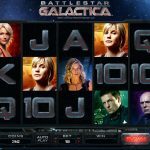 Join the gang from Battlestar Galactica video slot game from Microgaming while they will do even the impossible to aid you in your quest for prizes. You are probably familiar with the TV series with the same name. This sci-fi show is used as an inspiration for one of the most visually impressive games today. Everything here is top notch, from symbols, animations and sound effects. Battlestar Galactica is packed with special features. First things first, we have 3 different game modes normal, run and fight and they are each activated randomly. Special symbols include scatter and a wild. The wild substitutes for all symbols except for the scatter and it appears stacked on the first reel. 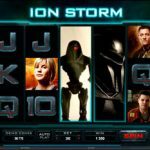 Then, we have the Ion Storm Bonus which is activated randomly during the normal mode. This is where up to 5 reels can be turned into wilds. Jump Bonus is activated every time the FLT symbol appears on the third reel. During this feature all card symbols are removed and the FLT will appear instead. The free spins feature is activated when you manage to land 3, 4 or 5 scatter symbols during the Normal mode. You will receive 15 free spins with x 3 multiplier. It is also possible to activate the free spins during the Fight mode, but here you will receive 5 free spins with an extra wild which has the ability to turn into split wild. We also have ranking system, as you progress you get new ranks in your career which later unlock exciting content for you. 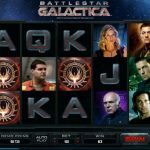 Kudos to Microgaming for coming up with a game like Battlestar Galactica. This is definitely one of a kind game that we love to play whenever we can. A great example of a super funny game would be Piggy Fortunes a 5 reel slot by MicroGaming.